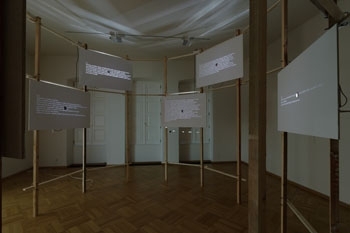 The installation It always makes her ill, when she thinks about the infinite, originated as Zbyněk Baladrán and Jiří Skala’s submission for the exhibition of the finalists of the Jindřich Chalupecký Award, an annual award in the Czech Republic for artists under the age of 35. 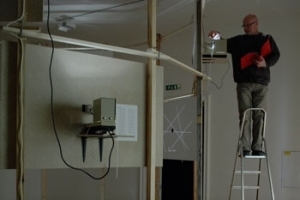 The artists decided to create a collaborative work, which would reflect their common interests (architecture and justice), as well as standing on its own merits. 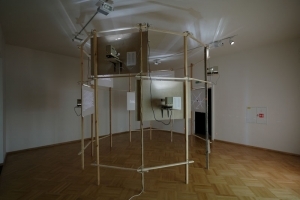 In a thorough renunciation of individuality, the artists decided to create two identical versions of the project: a and a’.The central theme of the work is an “honor court”, which was set up by a group of middle-aged architects in the early 1980s, to try those architects who were responsible for the Czechoslovak prefabricated housing structures of the 1950s, ’60s and ’70s.The artists perceived this moment in the history of Czechoslovak architecture as purely symbolic as one of the last attempts to improve the system of socialist panel housing. 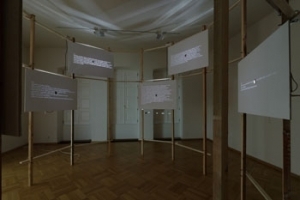 As no visual or sound recordings exist from the actual proceedings of this “court”, the artists decided to create a prototype of a projection machine, which would allow the individual exhibition visitors to form their own opinions on the issue.The installation is composed of a 12-sided structure with 4 entrances. Inside the structure, there are 8 projections, on 2 levels, with a hole in the center of each projection panel. 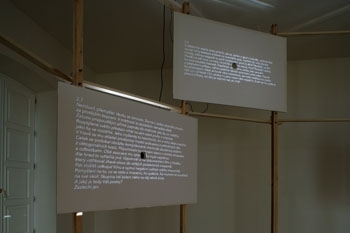 On the outside of the structure, slide projectors are mounted on shelves, with the focusing lens pointed through the hole from the back of each panel, and projecting the text based image onto the opposite wall of the interior of the structure. Each day, 8 out of a total of 64 texts, are projected. A gallery attendant changes the slides at the beginning of every day with the next set of 8 slides. The entire cycle of 64 slides of text takes 8 days to complete. The texts are fictitious, and cover four thematic aspects of the case, as perceived by the artists. The first set includes recollections of the accused on their experiences – mainly those to do with architecture. The second set consists of memories of a childhood spent in the panel housing blocks. 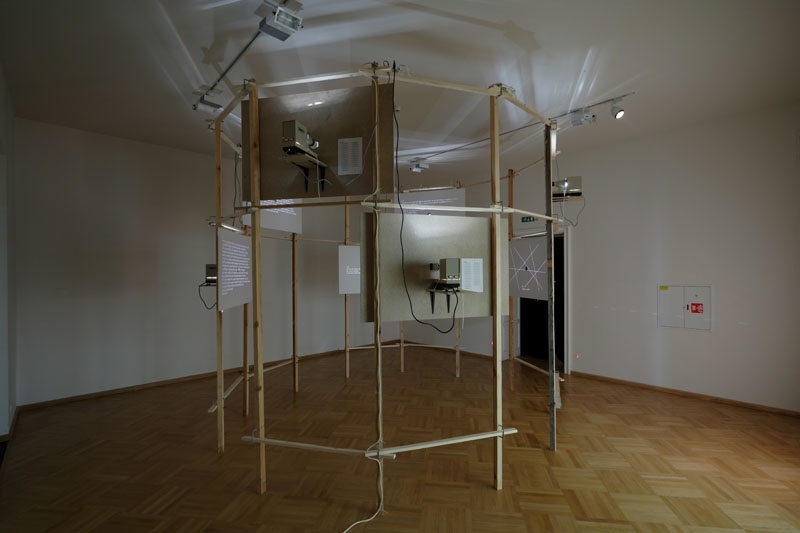 The third set reflects upon variations of a utopian vision of the city and confinement. And finally the fourth set, is made up of probable dialogue from the proceedings of the actual “honor court”. The modular construction system is a dream which will not let him go. He first encountered it during the war. There was a magazine in the bathroom of the Slávia cafe with an article describing and comparing various modular experiments in Europe and America. It was only part of the article, which was in French anyway, but he will never forget the photograph of the half-completed building with a foreman showing the crane operator where to put the next piece. 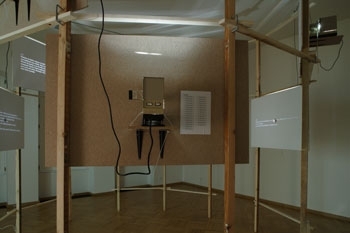 The second time he encountered standardized systems was at university, when following the sudden thaw due to criticism of the personality cult there were heated discussions about the form of modular panels for the construction of housing projects. He remembered erasing cornices and reliefs from his panel. He was happy that social realism would no longer influence building construction. He encountered modular building a third time when he prepared a vision for future cities and their composition. In his graduate work he proposed a visionary modular system comprised of units which could be stacked on one another. The interior of the standardized modules could be customized to fit the needs of each individual. Each “box” was designed to be placed using a helicopter. The fourth time he saw pre-fabricated panels was at the company where he began working after graduation. For several months he argued with his superior, who eventually demoted him to draftsman. They had argued about new technologies in construction and mass production. After this experience he became bitter and indifferent, and at the time he was not alone. The fifth experience he had with modular construction was when the company, after years of waiting, finally assigned him an apartment. He remembers to this day the reflection of his sad face in the glass, looking out at the endless rows of windows of the apartment across the street. Meanwhile, his wife was opening the kitchen cabinets gleefully and then yelled something at him from the bathroom. The sixth time, here at this court. Right behind the door to the apartment in the rectangular foyer is a small shoe rack with a hanger. Hanging on a little hook screwed into the board between the lower shelf and the upper rack, there are always some keys. There’s room for my mother’s keys, my father’s keys, a set of spare keys, and my keys. My sister is still too young to have her own keys. Each set is on a different key ring and has a different number of keys. I have the least, only a key to the building and one to the apartment. My key ring is on a wide ribbon, long enough for me to wear around my neck. Also on the ribbon is a little leather pouch with a snap, where I can put my keys. This is good for one thing. It keeps the keys from rubbing my stomach when I walk. On the way home from school I take my keys off my neck and swing them around on my finger. Sometimes I swing them so fast that they go flying somewhere unexpected. Once they hit my teeth, another time they ended up hanging in a tree. My dad had to get them down with a long stick, which he wasn’t happy about looking for them in the park. I felt very guilty. The first time I saw a toilet bowl in our apartment I was two years old. It hadn’t been installed yet, it wasn’t even in the bathroom yet. There was just a little bit poking out of the box. Wood wool packing was draining out of the discharge pipe. I walked around this mysterious object, leaned over it and looked inside. It got dark. “Get to bed” my grandma told me. The appearance of the first prison is well known. It looks like a fourteen-story apartment building. In the middle of the building is an elevator, which opens on to a central corridor running the length of the building on each floor. The individual cells are off the central corridors. The appearance of the second prison is not so well known. It is comprised of many different buildings located all over the city. The prisoners themselves have a difficult time finding their way around. They enter one building and come out at the other end. Then they have to look for the right door all over the city. They often ride the trams, since these are free by law. It is very stressful for them. If they are ever late, then their punishment is increased. As a child, his parents often found him sitting against the couch in the living room, staring fixedly at his legs crossed indian style. He would sit there for long stretches, without reacting to their questions: why did he do it? He didn’t know what to say. He looked at his hands, his legs, his stomach, and didn’t feel like himself. Why? Lately things had been wandering. For example: his leg, sometimes, without warning or any intention on his part, would suddenly jump forward a few centimeters. The first time he was surprised; he waited for something else to happen but the foot did not do anything other than what it was told. He felt as if his own body did not belong to him. He tried to give it precise orders, but his body would not do as it was told. Later in physics class he learned that his body, and everything else, is composed of invisible particles, which are constantly attracting and repelling each other. He learned what he had expected long ago: that his entire body was made of miniature little bodies. But he did not recognize them. They were not his own, they were foreign bodies. He didn’t even control them. They were from elsewhere. But why did he have to learn such a thing from a physics teacher? Why had he not known this from the very beginning by himself? Why did some stranger have to tell him? Over time he got used to it. She lit her fifth cigarette. She was standing in the mud and could feel herself getting sick… her own fault she thought. The client walked around the field with a sledgehammer, pounding wooden stakes into the ground. When he had sunk the first stake, he turned his back to her and paced off one hundred meters, military style. He pounded a stake in where he stopped, turned ninety degrees, then paced off another hundred meters. He marked off an entire square in this manner. She threw the cigarette to the ground. Her throat had begun to hurt. Why do I have to put up with this she thought to herself. He didn’t speak, he was thinking. Dusk was falling. In a single moment, the sun had blinked out behind the hill in the distance. It affected the room rather abruptly. The blinds which had let the direct sunlight into the room seemed to expand. No longer cast upon the floor in sharp stripes, the dispersed light gave a glow to the room. It did not affect his thoughts, nor did he even notice the phenomenon. In his mind he was assembling a spatial model composed of individual components. The entire shape resembled a complicated chemical compound made up of octagonal forms. It was like an orbiting space station with many corridors and wings. Both associations came back to him at once. But they were quickly replaced by another: He remembered a documentary film about a person who poured molten lead into a large underground anthill. Then he carefully removed the earth to get a negative cast of the entire ant colony. Thinking about what happened to the ants horrified him. For a moment he concentrated on his surroundings. The group of people around him stared at him mutely. And what do you all think about it? He only overheard. Nobody can find out that this is a court case, we’re going to tell everyone that it’s a discussion, otherwise we’ll never get the defendants in front of the tribunal. Apartment complexes. Unfinished. Of the thirty buildings roughly half are completed. Behind the last one is a field. The fifteenth building is complete. It has eleven floors. There are no sidewalks between the finished buildings, but there are boardwalks, some of them sunk into the mud. The buildings are separated by enormous piles of rubble and clay. Rabbits live in them. Some of the buildings are constructed on a landfill. In the middle is a puddle as big as a lake. Trash is washed up on the edges. A rusty old cup. Remnants of plastic items and some old reels of movie film. 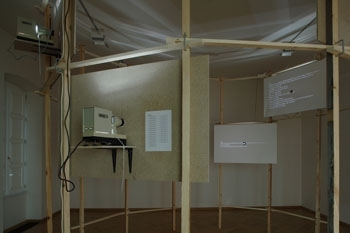 One reel tells the story of a completely enclosed cube. Its inner walls are white, perfectly smooth, and unblemished. No seams or cracks. Inside there are no insects, no mites. Not even dust. A person sits inside. Small shreds of skin slowly separate from his body, pulled by static electricity towards the walls. At the same time the court hearing took place. The defendants were high government officials and architects, the jury consisted of architects, the public were students. The charge was not exactly specified, but was based on the horrible state of affairs, for which the defendants were accused. Examined was the urban planning and the general building concept. The mechanical layout proposed by the accused has proven to have many errors. The defendants believed in scientific objectivity. The layout of their designs was intended to have universal validity. They did not permit errors. The prison had little security. If the guards did not have uniforms, few people from outside would be able to tell the inmates from their keepers. The prison itself looked more like a dormitory. A corridor ran down the middle, ending in a French window and ficus plant, both mirrored in their reflections on the shiny greenish linoleum. The individual cells, each for two prisoners, were simply furnished: beds, dressers, a shelf, a trunk, table, lamp and chairs. The bathrooms and showers were common for each floor. The guard’s room and director’s office were located on the ground floor by the main entrance. The building had been built several years previously, however certain equipment was still missing but was slowly being delivered. The prison director regularly requested immediate delivery but usually nothing came. Even though the prison was up and running, it still didn’t have any bars. After a while the director started to make arrangements with certain prisoners to let them work on minor details which weren’t finished. One of the guards, whose brother-in-law worked at the zoo not too far away, told everybody how they were putting the bars in for the big cats pavilion. They were doing the welding on-site using six meter bars. The workers had left the bars in a big pile by the construction site. This inspired the guard, who talked two prisoners who had welding certificates into helping him out. They borrowed a prison bus, and in the middle of the night headed out to the zoo. They even had a prison driver take them, since nobody had a license for the bus. They were back before breakfast with thirty eight bars piled into the aisle of the bus. Work on the bars took the prisoners a few weeks. Ever since that time, the prison has had bars on the windows. A lecture room. 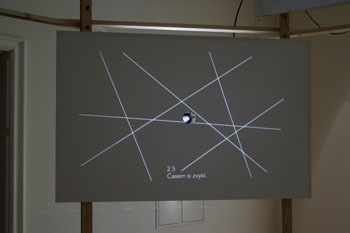 Behind the small lecture stand is an epidiascope aimed at the blackboard, which at the moment is covered by a drop down projection screen. The right side of the blackboard is not fully covered, and a chalk line marked “a” is visible. Under this, a small arrow points to another line, unmarked. 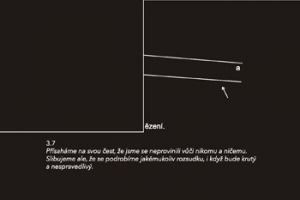 At the bottom of the blackboard, part of a sentence can be seen and the word fragment: ison. The shadows of the setting sun copy the frame of the glass wall on the floor and the opposing wall. The upper corner of the shadow crosses line a. The window handles point in different directions. The shadow of one points to the door. The shadow of another to the sink drain. The shadow of a third touches the electrical conduit running along the wall. A fourth shadow crosses the path of a fifth. The direction of the sixth is parallel to the seventh. The eighth shadow is swallowed by the window frame. You have disappointed us. It is not necessary to demonstrate your guilt. As a judge I don’t take sides, but I can’t help it when I see how deprived our society is. The deep wounds which you have given it and the scars which remain from these wounds will never disappear. For a crime against the entire society I therefore sentence you to eternal shame. We swear on our honor that we have committed no crime against anyone or anything. We promise however that we will abide by your decision, even if it is cruel and unjust. After the revolution I seized the opportunity. I went to a bank and asked for a loan. They wouldn’t loan me anything though. I sold my old Škoda. My father-in-law lent me 100,000 CZK. I started up a business with it. Today our holding company has an extensive portfolio. In the living room, on the wall, facing the door was an enormous library. When he was small, he thought it was the biggest thing in the world. It had eight shelves. From the first shelf he often pulled out colored picture books and lost himself in the large format photography showing mammals in various duels or a field of cotton in Kazakhstan or porcelain figurines from Munich or Baroque paintings by Flemish masters or the building of Nová Hut in Poland or schematic drawings of defunct buildings or facsimiles of Medieval manuscripts or cross-sections of the Earth or a map of the universe. The second shelf from the bottom was low and reserved only for magazines, piled on top of each other. The third shelf was taller, but not as tall as the bottom one. Here were field guides for birds, minerals, mushrooms and fish. The fourth shelf was the past, which he could just barely reach from the floor. This was for literature, not a very interesting shelf since there were no pictures. The fifth shelf was exclusively for his parents. He could only reach it from a chair and it held many brochures which he could not understand very well and which his parents often leafed through. The sixth through eighth shelves were unknown to him. He didn’t know what kind of books were kept there, it was too high. Not even his parents took many books out from there. When he asked what kind of books were there, they regularly responded that he was still too young for them. Once on the nightstand in his parent’s bedroom was a book which he immediately recognized from the spine. It came from the seventh shelf, fifth book from the window. The spine was ochre with no markings. But now he could clearly see the diagram drawn on the front of the book. It was a square divided into nine smaller squares. In each square were irregularly placed rectangles, on the edge were puffy shapes or cowering circles in the corners. The greatest mystery for him was the second, red diagram, which completely covered the first. It was placed in the middle of a large square and covered two-thirds of the original. Its shape was irregular, comprised mainly of interrupted lines. The most pronounced thing about it was the oval on the right side, and a cluster of amoeba-like things on the left side. He unrolled the blueprint on the floor, since it was so large that it would not fit on the table. On one of the bottom corners he placed a stapler, on the other a glass paperweight, a globe in which snow would fall on Prague’s Old Town. He then stepped on both upper corners, but had to stretch his legs so far apart that he was now twenty centimeters shorter. His co-workers stared at him with open mouths when he began to describe what they were supposed to see in the blueprint. In his right hand he held a slide ruler, which he used to point out individual clusters of lines below him. His legs were stretched out too far however, so they kept sliding outwards. By the time he started describing the small rectangle inscribed with the octagon, he was already fifty centimeters shorter. Visible through the windshield was a woman’s face, framed with the square glasses which were fashionable at the time and which covered most of her forehead and face. The man sitting next to her concentrated on driving and wasn’t listening to what she was saying. His face could not be seen because of the reflections of the buildings on the glass. They both turned their heads towards the passing wall of glass and aluminum. “I don’t like it,” she said, as the car turned down towards the river. Return to the initial point. The edge of each book placed on the table lined up with the others. When he had stacked the eighth book, he noticed the one which had so avidly discussed modular systems based upon the most modern materials. When he had placed the fourteenth book, his attention became fixed on the book which refuted those claims, emphasizing that for this type of construction the price was foremost. When the tower of books was as high as himself, the entire auditorium was watching him. It was evident that the younger majority of students were rooting for him. They whispered to one another excitedly, making it clear that they supported him. Those who had called this meeting nervously and loudly knocked about the things which had been prepared on the tables. They were not enjoying themselves. Those who held high official positions generally had their legs crossed and smiled indulgently. It was quiet in the room when he stood on his tiptoes on the folding chair and pushed another book on the top of the tower with his fingertips. We have gathered to discuss several things concerning the state of our architecture and construction. We may judge the consequences of the concepts born in the nineteen thirties first hand; we have been raised with similar principles and our conception is not entirely different. When he died, he had imagined it differently. He was convinced that there would be nothing. A few different ideas ran through his mind which were the exact opposite of nothing. At first he was surprised, it seemed banal to him. He was just sitting in a theater. He immediately realized that he was sitting in the eleventh row close to the spot which he always liked to sit. It was right before the film began. The house lights were on, but began to dim until completely dark. When it was dark, for a moment he heard the sound of his own breathing. His eyes tried to adjust to the darkness. He couldn’t wait until the film started, the film of his own life. The buildings follow rational and objective guidelines, not esthetic or artistic. To seek esthetic and artistic function in buildings is not scientific. Yes, a human being, as a higher organism, does have other non-rational needs, but these are not to be confused with architecture, scientific…. Firstly: construction is not esthetic, esthetics is only a name for a manner of perception. 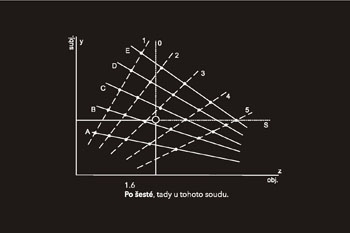 Secondly: a passively esthetic perception is freely attached to an object, to the bearer of esthetic function. Thirdly: there is no harm in designing a building without esthetic intent. Fourthly: the superstructure of passive esthetics is art as service and a high style. Above all: passive esthetics with its superstructure of art may not inhibit the implementation of new ways of objectifying working methods in construction. The design which we are proposing is based on a similar premise as yours, but is not as dogmatic, we develop it further. We utilize the most modern findings in the scientific and humanitarian fields. With technical…. The mechanical layout which we are constantly talking about is characterized by the following: Instructions are given regularly. No signs appear which might indicate that the instructions have not been followed. 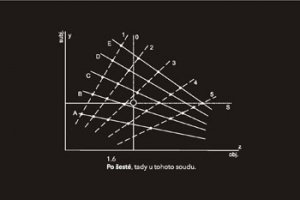 The boundaries of the design are unclear, it is difficult to tell who is part of it and who is not. This is hard to decide. I think that it’s time to talk about objectivity, that is, about interest rates. She stood on the sidewalk between pre-fab apartment buildings, in her left hand a mesh shopping bag full of items, and her right hand holding the purse hanging on her shoulder. She was facing a U-shaped wall, built of hollow concrete blocks. In front of the wall were two galvanized garbage bins. The left bin was closed. The top of the right bin was damaged and could not be closed. It was full of garbage, overflowing and dripping down to the ground around her feet. In the open garbage bin she clearly saw the trajectory drawn by the trail of her neighbors: the neighbors with children a floor up and on the left, the engineer and his wife without kids across the way, the terminally drunk driver from their company below them, the couple awaiting a child on the ground floor. She did not want to see them. She also saw the trajectory of her own life. She saw it so clearly that she drew back a step. She was not a fatalist, but what she saw had a strange, mathematical quality to it. Like the directions of individual lines, as if there was no doubt. She saw the entire apartment block clearly, all their fates. She became frightened and dropped her bag. The glass bottle of milk broke open with a dull sound. A milky map spread about her heels. The mesh bag looked like a tropical island surrounded by sea. The milk ran under her shoes, on one side meeting a chalk line drawn for hopscotch, on the other sucked under ground by the porous asphalt. She stepped out of the sea. For a moment her heels left behind two asphalt spots. A moment later they were covered by the milk. She reached into her pocket for a piece of paper and wrote with a pencil: how to take things apart and put them together again. When he spoke, he did not notice the surroundings. He did not notice that everyone was shaking their heads in disagreement. He spoke, and meanwhile thought about the meadow on which he lay with his wife many years ago. He had a blade of grass in his mouth and was telling her about physical phenomena, of indecisive states and of cats locked up in boxes. She did not feel good. She always felt sick when she thought about the infinite or similar things. Wait: You are talking about the conditions which were brought about by nationalization, a substantial decrease in rents, or the equation where eliminating interest + a standardized system = accessible quality housing? In 1949 I would congratulate you, except that now it is the eighties. Let’s go for a walk in South City! Yes, well let’s forget that it was that bad, let’s get back to the current problems, and what are we going to do about them now? Hypothetically: today we have socialism, production is falling, general lethargy prevails. When interviewed by the reporters sent by the central government, the majority of people are scared and say that they are happy. Hypothetically: today we have communism. Nobody works, all needs are met, no complaints are ever heard. In the central office for complaints, there are no records of even a single complaint for the past few years. Hypothetically: today we have capitalism.